Then our dentist changed her visits from every 3 months to every 6 months and told my wife she was no longer a candidate for gum surgery. WHEEU! Are you worried because your gums are bleeding, are they red and puffy, tender, sensitive to hot or cold, starting to recede, loose tooth, or do you seem to constantly have bad breath? If you are experiencing any of these symptoms you’ve got pre or full blown periodontal disease/gum disease. And you should be worried because not only may you lose your teeth, but periodontal disease is now linked to heart disease, stokes, respiratory disease, digestive disorders, pancreatic cancer, and preterm low birth weight babies, diabetes and obesity. It all starts with an onslaught of bacteria invading your gum tissues. Bacteria can literally multiply by the millions in just a few short hours and if left unchecked can form plaque, then tartar, and the next thing you know you have a pocket. A pocket is a separation of the gum tissue from the tooth and your dentist will measure them in millimeters – tooth number 7 is a 4, 22 is a 6 and so on – the larger the number the deeper the pocket and the worse your condition. Here’s what happens, the bacteria builds up and invades the pocket. You will notice some bleeding as this occurs and maybe redness or gum swelling. As the bacteria hides in the pocket, it turns into toxins or poisons and starts eating away at the gum tissue and bone of the tooth causing receding and possibly a loose tooth. When it is deep enough the bacteria is getting access to your blood and the next thing you know you’re finding yourself with all kinds of health challenges and big dental bills. No matter what caused it, if you find yourself in this position with gum disease or pre gum disease, then you must aggressively fight the problem or you are going to begin losing your teeth and battling other health challenges. When you’re in the midst of the battle it is nice to get some reinforcements. The first thing (first punch) you have got to do – and any dentist will tell you this – is to establish a good oral hygiene program. The second thing (second punch) you have to do is to get the bacteria under control and that’s where OraMD comes in. You’ve got to have a formula for success to win the battle. OraMD is a liquid toothpaste, mouthwash, and breath freshener that is the best product on the planet to fight the bad bacteria in your mouth. This precise formulation of three 100% pure botanical oils of almond, spearmint, and peppermint is designed to kill the bad bacteria that are ravaging your gums. There are 100’s of types of these 3 botanical oils and dozens of properties for each type – literally millions of combinations. This is a scientific formula matching the right properties of the right oils and designed specifically to combat the bacteria in your mouth. There is nothing like it on the market – it’s fast and effective, and it leaves a real fresh, clean feeling in your mouth. Most people notice results immediately – within one to three weeks. In more serious cases like pockets, it took a while to get there, and it may take several weeks to several months to desired results. 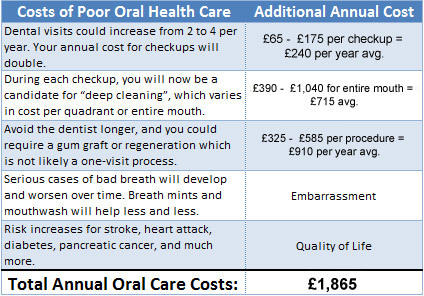 Worst case scenario, you still have the same problems, but you now have one of the best preventative system avaialable to guard your remaining teeth. Why doesn’t my TOOTH PASTE and MOUTHWASH work? Virtually every tooth paste has an ingredient in it called Sodium Lauryl Sulfate. This ingredient is what makes your toothpaste suds up, but is a harsh chemical that is used the world over in clinical studies to irritate the skin. It is also used in car wash soaps. The last thing you want to do when you have a gum problem is continually apply something to your gums twice a day that is an irritant. Mouth wash with alcohol is a formula for dry mouth. Alcohol will dry out your mouth and dry mouth leads to bacteria multiplying voraciously – into the billions. What excuse are you going to use for your bleeding gums, losing your teeth, the big dental bills, or the embarrassment of bad breath? Why don’t you give your gums a fighting chance with our no risk offer? We have been in business for over 10 years and have served tens of thousands of customers just like you. We are so sure you will get the results that you want, that we are going to give you a whole year to prove our product and our 4 step program is working for you – no one and I mean no one else has enough confidence in their product to make this guarantee! And yes here’s the catch – All you have to do is follow the 4 steps – nothing will work for you if you don’t follow a good oral hygiene program. Guarantee – You guarantee to use the product as directed. We guarantee your complete satisfaction – if for any reason you are not completely satisfied within one year we will issue a prompt and courteous refund of all your money in full – no questions asked. All Prices Reflect US Dollars. Please Note: The free bonuses of Dr. McGuire’s books, Healthy Teeth – Healthy Body & The Poison in Your Teeth, are offered as free eBook downloads. YOUR PURCHASE IS PROCESSED ON OUR SECURED SERVER. YOUR DATA IS SAFELY ENCRYPTED AND IS SAFE FROM UNAUTHORIZED ACCESS. OraMD® is all natural, 100% pure, essential oils of almond, spearmint and peppermint. There are hundreds of varieties of these oils from all over the world and they all have different properties. This scientific formulation is designed to eliminate bacteria and pathogens that are the cause of gum disease, gingivitis, bleeding gums, canker sores, and bad breath. This is a truly great product! OraMD® is unconditionally guaranteed for a full year so we are taking all the risk.To read more on gum disease treatment, mouthwash,periodontal disease, receding gums or halitosis, click one of the links provided.